The recent Asia-Pacific Economic Co-operation (APEC) summit in Papua New Guinea provided the expected confrontation between US-led western allies and China. It was the outcome of months of the former engaging in high-level, tense diplomacy, toward China. The rapid rise of China has been assessed by US-led western allies to have threatened traditional hegemonic positions, particularly in the South Pacific. Two other developments, however, timed to coincide with the summit, would appear to throw light upon coordinated diplomatic activity by US-led western allies; their waves of militarism in the Asia-Pacific region are linked with similar planning for Europe. 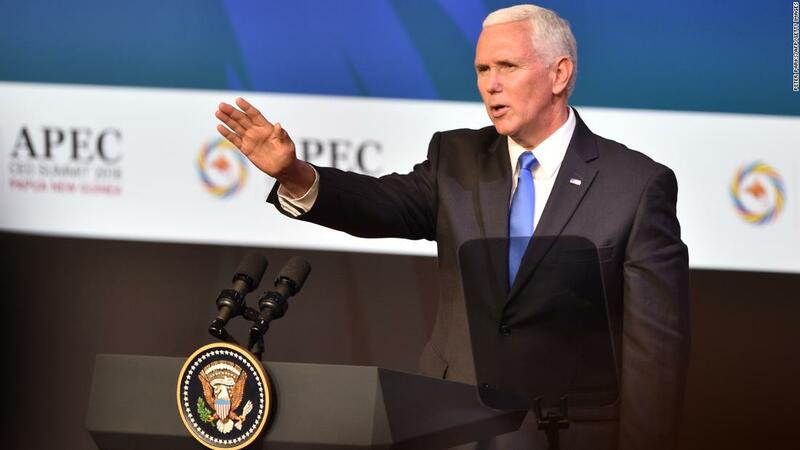 The recent APEC summit in PNG included what was described in diplomatic talk as a 'tense exchange' between US vice-president Mike Pence and China's President Xi Jinping. (1) It was to be expected following months of a US-led rising tide of militarism and hostile diplomacy toward China, largely played out over PNG, a dominant country in the South Pacific. The US-led position is best described as bellicosity using Cold War rhetoric, a departure from usual diplomacy. The role of Australia toward 'our patch' in the South Pacific has historically been paved with good intentions but very little else. While strategically important for Australia, the countries were provided with little practical support to develop their own economies. Even today, after producing vast profits for Australian-based mining companies, their economic plight remains dire; they have been pillaged and plundered by neo-colonialism. PNG has an average income of only $4,200 per head of population, the Solomon Islands has $3,000 per head, Vanuatu, $4,500 per head. The figures, however, are grossly misleading; vast differences between wealth and poverty exist side by side with the majority of the populations having little more than subsistence living standards. The involvement of China in economic development programs has usually been aimed toward longer-term planning and modernity. China claims that it will eventually enable the countries to build stronger, independent economies. It is, therefore, not difficult to understand the role of US-led resistance to the role of China in the South Pacific. The present US-led position toward China is based on military planning which includes real-war scenarios. The US military planning has, in recent years, been adapted to also include Japan as a northern regional hub for 'US interests', in a triangular diplomatic relationship with the US and Australia. Its main defence and security focus has been encircling China and attempting to contain influences assessed as threatening traditional hegemonic positions. The moves also include Australian proposals for convening 'an annual summit for heads of Pacific security forces in Canberra', to strengthen regional diplomacy. (11) The annual forums are likely to include further intelligence-gathering and sharing, conducted through US-led military facilities. Discussion, within PNG, however, would indicate some controversy is already taking place within the corridors of power in Port Moresby. A recent media release 'prompting a warning from Manus governor Charlie Benjamin', about whether it would be used to advance the Australian position without consultation, for example, provide evidence the military planning was foisted upon PNG from US-led levels. (14) Decision-makers in PNG, it would appear, were merely expected to follow directives. Secondly, an announcement from French President Emmanuel Macron about the creation of a European army with 'European leaders to take more responsibility for their defence and security', together with the establishment of a European intelligence agency, received scant media attention in Australia. (15) Due to the historical links between the US and western European countries, it would appear highly unlikely the proposed European army would be independent of US military planning. A more likely scenario being a possible US reduction in European-based military personnel and defence funding. Both developments, in the South Pacific and Europe, carry a common strand: the US is seemingly distancing itself from future large-scale military ventures and moving toward a position where regional hubs will be front-line forces. US military planners, based in the Pentagon, will continue to be engaged in exercises, war-games and likely real-war scenarios, but expect allies to make a bigger contribution to the defence and security of 'US interests'. We require an independent foreign policy before the real-war scenarios begin! 1. Cold War in the Pacific, The New Daily, 17 November 2018. 2. China hits back with barley sales probe, Australian, 20 November 2018. 3. China sparks APEC standoff, Australian, 19 November 2018. 4. China v. US in the Pacific comes to a head in Port Moresby, The Weekend Australian, 17-18 November 2018. 6. Japanese PM set to visit sub war grave, Australian, 13 November 2018. 7. Morrison walks fine line between powers and does fine job, The Weekend Australian, 17-18 November 2018. 9. Alliance to test China in Pacific,The Weekend Australian, 17-18 November 2018. 10. Atonement, Top End Style, Australian, 13 November 2018. 11. Allies join forces for standoff with China, Australian, 19 november 2018. 12. Australia 'top PNG security partner', Australian, 9 November 2018. 13. Australian, op.cit., 20 November 2018. 14. Warning over Manus navy hub, Australian, 20 November 2018. 15. Macron's move to make Europe responsible for its own security, Australian, 20 November 2018. 16. America's Permanent War Complex, The American Conservative, 15 November 2018.